Bugatti is a brand that offers more than just a single model these days. In the recent past, the French manufacturer only had the Veyron in several modifications, but now it sells the Chiron, Chiron Sport, and Divo. Well, all of them are based on the same car but it still counts. Earlier this month, the automaker showed another special edition model celebrating the brand’s 110th anniversary, and yet another vehicle is rumored to join the Chiron-based lineup in early March. What if this car is actually a speedster version of the Divo? The latest gossip indicates that Bugatti is planning a one-off creation with a staggering price of $18 million which should debut at the 2019 Geneva Motor Show in the first days of next month. It is believed it already has an owner, namely former Volkswagen Group Chairman Dr. Ferdinand Piëc, but that’s not the most interesting thing about it really. All other details are a mystery and we can only speculate at this point. And this is exactly what we are going to do for a good start of the week. 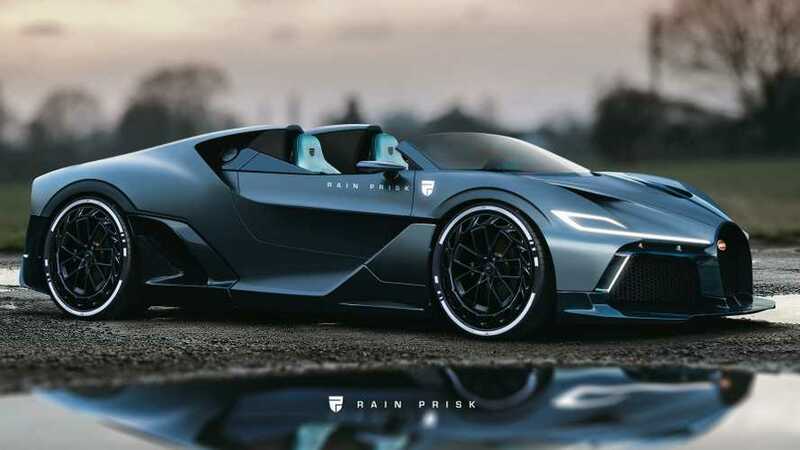 Let’s imagine the Chiron-based hypercar in question is this stunning Divo Speedster which comes from our friend Rain Prisk, the talented automotive designer that has some crazy ideas. This rendering proposes a more dramatic take on the Divo with a more aggressive aerodynamic body kit and a traditional speedster engine lid. Even the shape of the headlights is vastly different to the original Divo, not to mention the side skirts, side air intakes, and, especially, the wheels. That’s indeed a pretty drastic makeover of the Divo and, dare we say, it looks both plausible and amazing. We will have to wait two more weeks to find out whether rumors were true and Bugatti is, in fact, planning a one-off hypercar. One can only hope it takes the shape of this Divo Speedster.